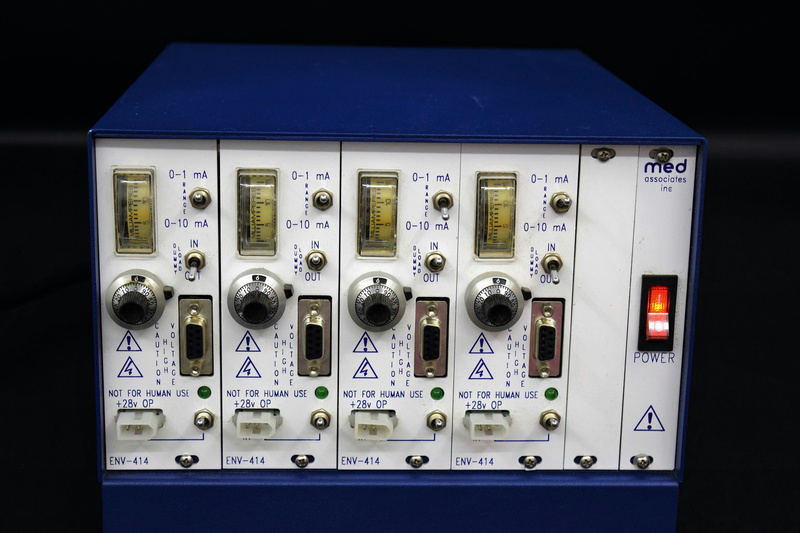 Med Associates SG-6080C Tabletop Cabinet Power Supply Scrambler Modules ENV-414 . New Life Scientific, Inc. This is a used cabinet and modules with minimal cosmetic wear and in good condition. The power supply does power up but we have no way of testing the gauges. The scrambler includes a solid state grid floor scrambler on a double-width module; this cabinet contains four of these. Combined module is less expensive than individual modules for applications requiring only scrambled foot aversive stimulation. This provides constant current stimulation with continuous regulation at a lower voltage that eliminates the possibility of tissue damage.Cable required: SG-216A-10 with male to female molex. What is displayed in the pictures is what you will receive unless otherwise specified.